unions require a confederation with far more centralized power over taxation and other policies than European leaders envision for the eurozone. Rogoff provides a good primer here, explaining that a single currency works for the United States because (a) workers can freely move from depressed areas to more vibrant ones, and (b) national tax policy automatically shifts resources from rich areas to poorer ones. This keeps the entire country in rough balance even though some states have better economic growth and more highly paid workers than others. States that run “trade deficits” with the rest of the nation will never get too far out of whack. But Europe has neither of these things. Technically, workers in the EU can move freely between countries, but in practice language and cultural barriers are far stronger than they are in the U.S. Spanish workers in Seville just aren’t very likely to move to Frankfurt even if lots of jobs are available there. And although Europe does engage in a modest level of fiscal transfers, it’s nowhere near big enough to make up for the persistent imbalances between the core and the periphery. As a result, countries that run trade deficits with the rest of Europe can very decidedly get too far out of whack and end up in crisis mode. 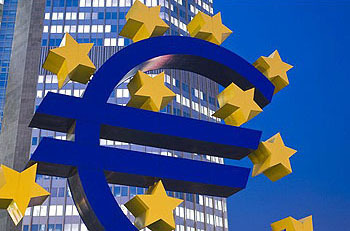 So what’s the likelihood that the euro will survive? Rogoff says that without “further profound political and economic integration” the euro might not make it to the end of the decade. But what are the odds of that integration happening? For what it’s worth, the punters at InTrade don’t think it’s very likely. They figure there’s a 21% chance of a country leaving the euro by the end of 2012, a 35% chance by the end of 2013, and a 43% chance by the end of 2014. There are no bets available beyond that, but the trend is pretty clear. Not many people would be willing to put money on the chances of the euro area staying intact by 2020. Neither would I. Free movement of workers in the eurozone is constrained not by law, but by language and custom, and there’s just no way to speed that up much. This means that for the foreseeable future fiscal integration would have to bear the full weight of making the euro into an optimal currency area, and it’s really hard to see the rich countries of Europe being willing to provide the required level and persistence of aid to the poorer countries year after year after year. It’s not impossible, just really unlikely. There’s a lot of political reluctance to give up on the euro, and a lot of technical reasons why breaking up the eurozone would be really hard. But even so, I’ll be at least a bit surprised if it’s still around in 2020.